"Where No X-Man Has Gone Before!" The X-Men emerge from the stargate onto an alien planet dominated by a large crystal, and are faced with the Shi'ar Imperial Guard. 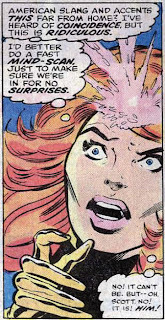 When the Guard refuses to release Lilandra, the X-Men attack, despite being heavily outnumbered. On the crystal's dais, Emperor D'Ken summons the Soul Drinker to destroy Lilandra but she is saved by Nightcrawler. 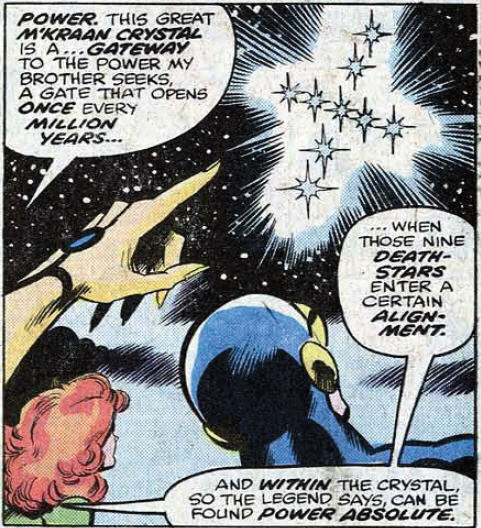 As the battle continues, Lilandra explains to Cyclops and Phoenix that once the nine death stars over the planet align and imbue the M'Kraan Crystal with energy, D'Ken intends to use that power to make himself all powerful, but she fears that power will destroy the universe. The X-Men, who at first took the Imperial Guard by surprise due to the sheer ferocity of their attack, are soon worn down by the Guard's superior numbers and overwhelmed just as the Starjammers arrive and help turn the tide. Soon, the Guard is defeated, but D'Ken doesn't care: the death stars align, and the M'Kraan crystal is flooded with energy. The crystal magnifies that energy, and as it builds, all of reality blinks out of existence for a moment. Aboard the Starcore space station, Dr. Corbeau confers with Reed Richards on Earth and the pair agree that they have no idea what caused reality to blink but they know that if the blinks continue, the universe will die. The Shi'ar Imperial Guard make their first appearance and serve as the villains of the piece, though they are merely following the orders of their emperor. Prior to his run on X-Men, Dave Cockrum made a name for himself as the artist on DC's Legion of Superheroes, and each member of the Imperial Guard is modeled after a specific Legionnaire (Gladiator is Superboy, Mentor is Brainiac 5, Hobgoblin is Chameleon, etc.). After cameos by members Corsair and Cho'd in issue #104, the Starjammers make their first full appearance in this issue, and in addition to the characters we've already seen, include the cyborg Raza (who speaks in Shakespearean lingo) and the feline Hepzibah (who is named for a character from the "Pogo" comic strip). The Shi'ar Emperor D'Ken, Lilandra's older brother, appears in full for the first time, as does the demonic Soul Drinker (which was adapted into an episode of the X-Men animated series) and the M'Kraan Crystal, a powerful and cosmic device that will feature in a few X-Men stories through the years. This the final issue of Dave Cockrum's first run as the book's penciller. With the book on the verge of going monthly and having just accepted a staff position at Marvel to design covers, characters and work on merchandising art, he bowed out, feeling he would be unable to meet a monthly schedule. Lilandra lays out the details of her backstory and D'Ken's plan: after declaring his intention to harness the power of the M'Kraan Crystal, Lilandra, fearing this would lead to the destruction of the universe, opposes him and is declared a traitor. En route to being executed for treason, Lilandra escapes and after her mind links to Professor X's thanks to the telepathic beam of human consciousness he used to repel the Z'Nox, heads towards Earth. D'Ken's telepathic agents also detect Xavier's thought beam, and deduce that Lilandra is headed there. 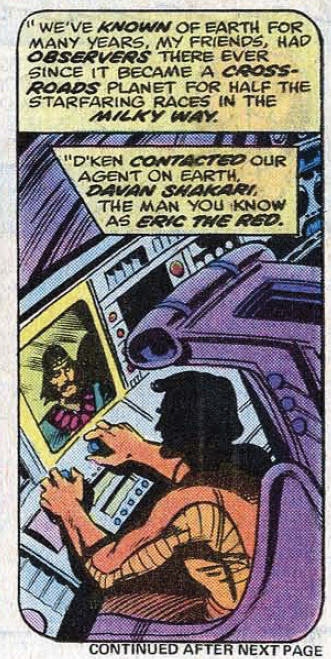 D'Ken contacts the Shi'ar agent on Earth, Davan Shakari aka Eric the Red, and orders him to prevent Lilandra from contacting Xavier. Using Havok, Polaris and assorted X-Men villains, Eric attempts to kill the X-Men in order to clear a path to Xavier, but fails, until Firelord gives him the opportunity to capture Lilandra and bring her to D'Ken on the world of the M'Kraan Crystal, where D'Ken is waiting for the death stars to align and imbue the crystal with power. Though in issue #105 he claimed that Lilandra exiled him to Earth, here Eric the Red is referred to as the Shi'ar's agent on Earth, suggesting it is a post he was assigned. As we've discussed in the comments of some past entries, it's possible that Lilandra, Grand Admiral of the fleet before her arrest, simply assigned him the post, but he viewed it as an exile. 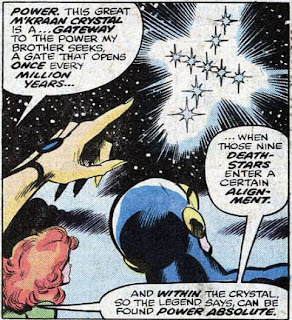 Lilandra says that the Shi'ar have known of Earth for years and "have placed observers there since it became a crossroads planet for half the star races in the Milky Way," a clever in-story nod to all the stories involving aliens like the Kree and Skrulls sprinkled throughout the Marvel Universe. 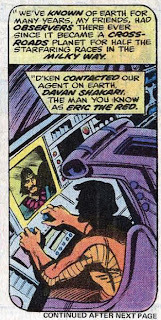 Also, Eric the Red is depicted as having human-like hair, as opposed to the triangular feather-like hair of the Shi'ar. A point is made that the Shi'ar have evolved from avian ancestors as opposed to mammalian ones. The backup story in the Classic X-Men reprint of this issue fleshes out Lilandra's escape and her first contact with Xavier, offering more details about their first mental contact. We see Storm take charge for the first time, and she notes that's its only been a day since Magneto attacked the X-Men in issue #104 (see also helpfully tells us Banshee's full real name, in we're the Imperial Guard or this is our first issue of the comic...). Cyclops and Wolverine continue to bicker. Nightcrawler teleports with another person for the first time, and the strain of doing so is great. Wolverine's costume is destroyed during the battle, and he (off-panel) forcibly removes the costume of Imperial Guardsmen Fang to replace it. He will continue to wear that costume until issue #109. Lilandra refers to the Z'Nox as a "minor, freebooting race", a quick way to establish the power of the Shi'ar by having them comment on the last, and to this point, most fearsome, alien race the X-Men encountered. Struck by his use of American slang and his accent, Phoenix reads Corsair's mind, only to discover something so shocking...it will have to wait until next issue to reveal! Though this issue was published only a few months after the movie was released, this story bears some resemblance to Star Wars, with a princess (Lilandra) looking for help from an old wizard (Professor X) and getting rescued by that wizard's trainee (the X-Men) and a space pirate (the Starjammers), while both stories feature the evil power of Death Stars. Though these similarities are likely highly coincidental, in added pages of the Classic X-Men reprint, Claremont has Nightcrawler acknowledge the them by saying, "Eat your heart out, George Lucas: this is a real Star Wars". Claremont turns in some wonderfully baroque, comic book-y narration in this issue, including, "the world is as old as time and its cities have stood silent and empty since before mankind was born," and "it begins. And, in moments, a once-tranquil plain ... is turned into a scene out of hell." 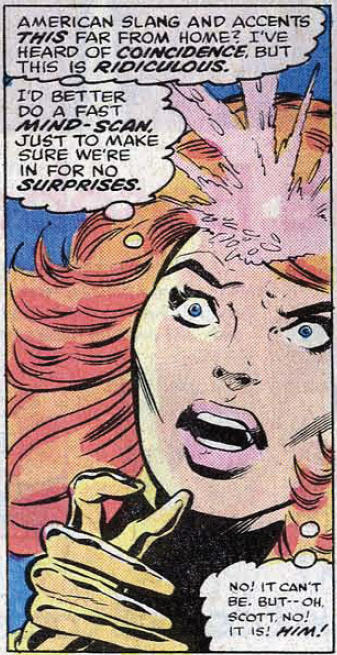 Claremont explicitly links this story to the final Thomas/Adams issue, the previous run on the title he most admired (or, by some accounts, the only previous run he'd read at this point), by having the Z'Nox-defeating "thought beam" from that issue serve as the device which first joins Lilandra's and Xavier's minds. Cockrum goes out on a high note, turning in his best issue yet, and it's one that features several dozen characters, all of which are uniquely rendered while the action remains easy to follow. 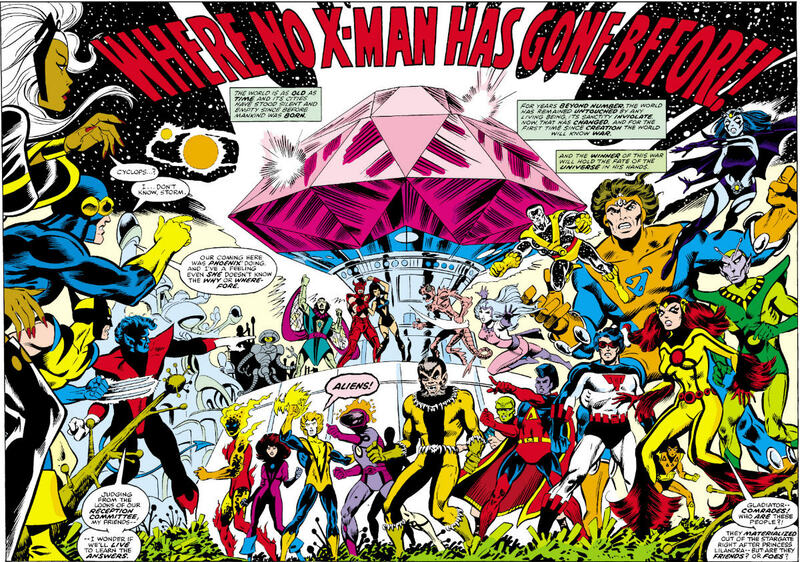 The opening splash page is particularly dynamic, and will go on to appear in many places as a visual shorthand for "Dave Cockrum's X-Men." Lilandra describes the first connection between herself and Xavier as feeling like she'd found a missing piece of her soul, echoing Xavier's sentiments from last issue. 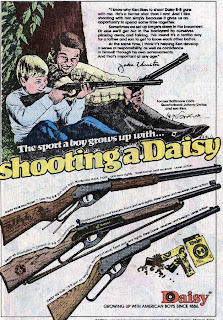 Love these old Daisy Air Rifle ads. "At the time, I was also going on staff at Marvel and I discovered that it's kind of difficult to take the train into New York, work eight hours, take the train home again and then sit down and draw a comic book. So I gave up drawing for a while." DeFalco, Tom. Comic Creators on X-Men. London: Titan Books, 2006. p92. "I had originally come up with the Starjammers as a concept for an individual series, and I approached Roy Thomas with the idea, suggesting I could either do it in Marvel Premiere or Marvel Preview. He said both books had enough inventory for two years and in the end I got so frustrated about not being able to do Starjammers anywhere that I proposed it to Chris, the idea being that we would work it into X-Men somehow. That's how Corsair became Cyclops' father and all that other stuff. Starjammers was originally going to be a stand-alone space pirate series - swashbucklers in space - and I wound up donating it to X-Men." The threads of the Shi'ar story come together and we finally learn what the events of the last several issues have been building to as the first example of what have become known as "X-Men in Space" stories begins. 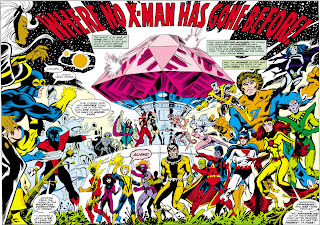 These kinds of stories have long been a divisive subject amongst fans of the X-Men, with many people feeling that dropping the X-Men into full blown space operas on alien worlds moves them too far away from their core themes, of being a metaphor for discrimination, of "protecting a world that fears and hates them". However, it could be argued that the X-Men have been, for most of their history, far from traditional superheroes: there has for most of their history been a socio-political undercurrent to their stories (these characters fight for their very survival, or for the rights and privileges of their species, in addition to the usual "out to rule the world" type villains) and the characters have long eschewed the traditional superhero setup (the X-Men have always avoided the kind of secret identity hijinks that entail characters like Spider-Man or Superman, and rarely struggle with the idea of balancing their super hero lives with their real lives; the X-Men, for the most part, are ALWAYS the X-Men, even when they're not wearing costumes, an idea Claremont will explore further). If the X-Men aren't traditional superheroes (or, at least, are MORE than traditional superheroes) what are they? 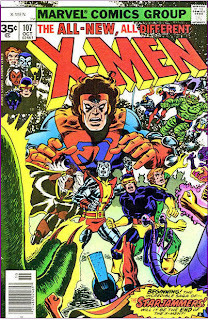 With this story (and subsequent "X-Men in Space" stories) Claremont suggests an answer: more than Superheroes, the X-Men are Science Fiction characters. This includes superheroes (as superheroes are wedded to numerous sci-fi trappings) but it also includes other things: aliens and starships and space pirates and stakes on a cosmic, not just a planetary, scale. 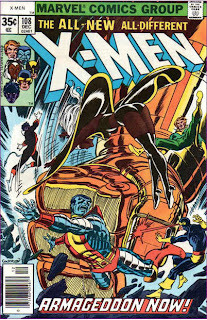 It is a logical conclusion: Science Fiction is based in metaphor, with outlandish, futuristic and/or alien elements serving as a reflection on contemporary society, and the X-Men have from the earliest issues been more overtly metaphorical than many of their superhero peers, standing in for discriminated peoples everywhere. By no means is Claremont offering this as the definitive take on the X-Men (he himself will also try "X-Men as Fantasy characters", and as characters that are almost aggresively anti-Superhero), but rather is simply trying to show that the X-Men can easily operate in a genre beyond that of the traditional superhero. Of course, this story is, literary theory aside, more obviously born of Claremont's desire to tell bigger and bigger stories married to Dave Cockrum's knack for drawing fantastic alien landscapes and futuristic technology (honed during his years drawing DC's Legion of Super-Heroes). Put aside the sci-fi trappings and we're left with a story that fits in squarely with the core idea of the X-Men, just one with bigger stakes than ever before. The X-Men are sworn to protect a world that fears and hates them; here, protecting that world just means doing it on a planet far away from their home, from a foe that threatens not just Earth, but the entire universe. Some do. Most are mildly indifferent. For me, I don't mind "X-Men in Space" stories so long as they're good. Just like everything else, there are good ones and bad ones, but I don't believe ANY "X-Men in Space" story is inherently bad, even if it does have to work a little harder to be good. 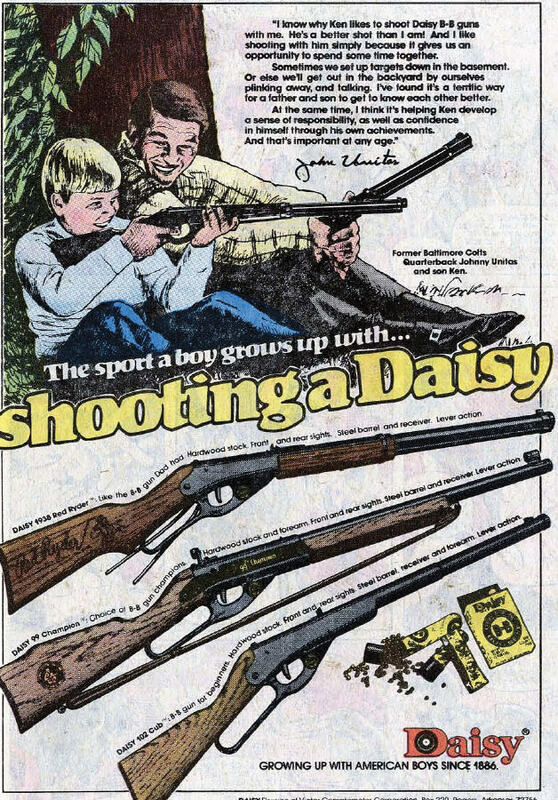 Yeah, it's a somewhat sad example of how the business operated back then. He wanted to do this book on its own, and couldn't, so he worked the characters into a comic he was leaving, and from that point forward, lost what little control he might have had over the characters. Nowadays, he'd just self publish his space pirates book, or take it to Image, or something (which is also why you don't see as many good original characters these days; creators want to maintain control over their truly inspired creations instead of just handing them over to the work-for-hire mill). I've only seen bits and pieces of it on TV, but I believe it's pretty much what it looks like: Jaws with a killer whale. 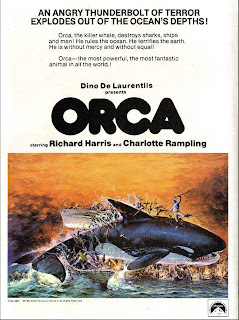 Man, i gots to see that Orca movie! I like "X-Men in Space" stories once in a while, but they shouldn't be the norm. Back in the 90's, when I was an avid X-Reader, there came a point where several X-Men (Rogue, Beast, Gambit, and some others) went into space to fight the Phalanx. When the story started, my involuntary response was something like, "finally!" 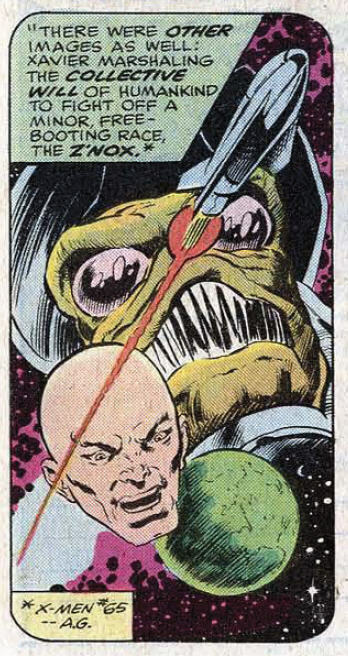 I'd been waiting years for an "X-Men in Space" story without even realizing it! Of course, that particular story turned out not to have been worth the wait, but the point remains that I had been trained to expect the X-Men to travel off world every few years! Also, I love that issue 104 was "barely a day" earlier than 107. Besides that, 107 continues directly into 108, which pretty much leads directly into 109. I figure at most, two days passed from 104 - 109, which were published over the course of ten months! And yet, with the exception of 107-108 which is a 2-parter, each issue is pretty much a standalone adventure. I feel like this style of storytelling, where events are densely packed into short periods of time, has fallen out of favor in recent years, possibly due to the "decompressionist" style of writing, but I'm not sure if that's the only cause. But anyway, Roger Stern used to be really good at the "rapid series of events in a short amount of time" thing, too. 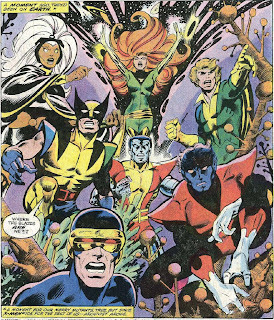 And one of the things I loved about Byrne's X-Men: The Hidden Years when it started was that the entire first dozen or so issues took place over the span of something like two days! Lastly, I absolutely love that splash page you posted. 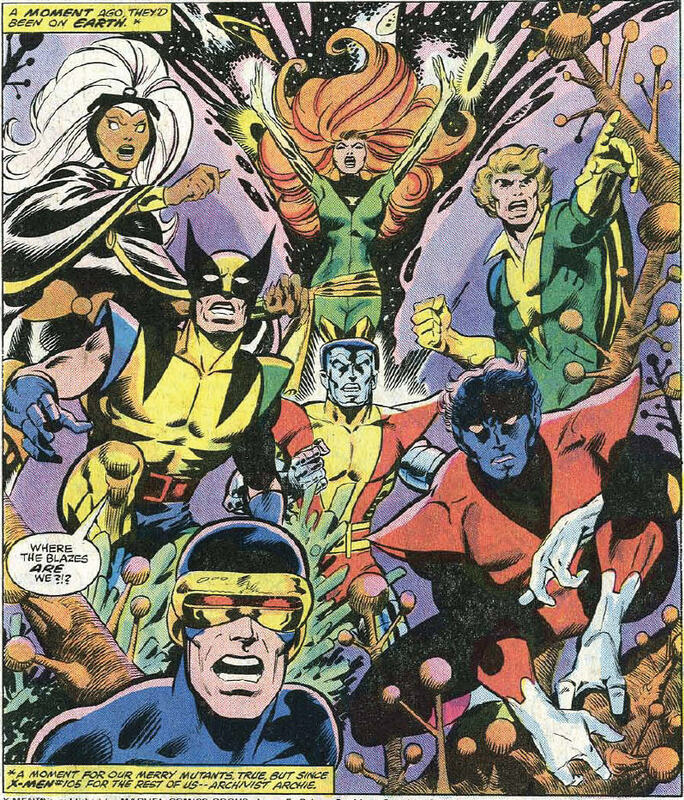 To me, more than pretty much any other grouping, those are the X-Men! 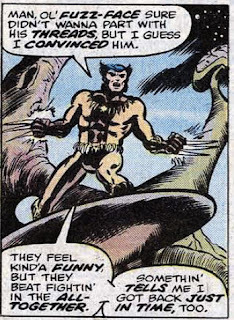 Oh, and speaking of Fang's costume -- didn't Cockrum intend to make it Wolverine's permanent new look? I believe that's why Byrne drew him in that outfit in Iron Fist #15 -- but as soon as Byrne had full artistic control of the X-Men, he (thankfully) returned him to his original look! As Matt already mentioned, my understanding is that the Fang costume Wolverine acquires here was intended (I've always heard by Cockrum) to be his new costume, but once Byrne took over, he brought back the old costume as quick as he could. I have yet to find a source on that little anecdote, but I'll probably "officially" mention it in the post for issue #109. @Matt: Of course, that particular story turned out not to have been worth the wait, but the point remains that I had been trained to expect the X-Men to travel off world every few years! Very true. For better or worse, "X-Men in Space" have become part of the storytelling engine to the point where we come to expect them every so often, especially for people who started reading after this initial space story and never knew the X-Men without SOME connection to the Shi'ar, outer space, etc. 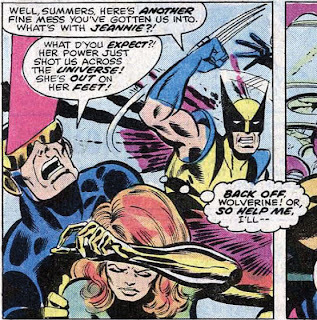 And, while I know Anne and Sarah have a fondness for that story you mentioned, I've never been a big fan of it either (it actually comes to mind whenever I think about "X-Men in Space" stories that aren't very good). Also, I love that issue 104 was "barely a day" earlier than 107. Besides that, 107 continues directly into 108, which pretty much leads directly into 109. And there's Iron Fist 15 in there, too, wedged between #108 and #109. Definitely. I don't know if decompression is entirely to blame (as that tends to draw out stories by its very nature). It might partly be because we see fewer and fewer extended runs by creators; when you have a new writer/artist every 6/12/18 issues, the tendency is for the new guy to shake things up and imply or establish a passage of time between the end of the last creator's run, making the events of each story feel even more spaced out. I dunno what's to blame, but I definitely miss that feeling of "tons of stuff happening quickly". It also helped sell the idea of the time passing slowly in comics. 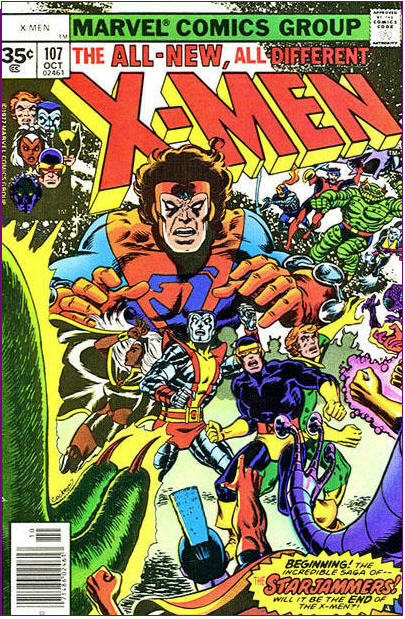 I loved about Byrne's X-Men: The Hidden Years when it started was that the entire first dozen or so issues took place over the span of something like two days! It reminds me of a teacher I had in high school who would ask us what kind of "wheels" we had. @Joan: It reminds me of a teacher I had in high school who would ask us what kind of "wheels" we had. Ha! Did he then ask who was going to the sock hop? Out-of-touch adults trying to sound "hip" and "cool" but hilariously missing the mark is one of my favorite things, ever. Only Claremont seems to be able to write good "X-Men in Space" stories, with the finale to the Phoenix saga with Byrne, the Paul Smith Brood stories and even the Jim Lee "Warskrulls" being high-water marks. Not just in space X-Men stories, but in the X-Men as a whole. Also, maybe it's the pairing of Claremont with an artist that can really draw the crazy imagery he describes. As good as "Joe Mads" was, his manga-inspired imagery was too much for Lobdell's pedestrian scripts and his tendency to set up plots that were never resolved. He needed a better writer. Much later, you have Morrison's amazing ideas in Imperial hamstrung by Kordey dashing off unintelligible scribbles in a day, compared to Whedon and Cassady's well thoughyt out and well rendered Unstoppable. Issue at hand: Super good. Although even Claremont is capable of turning in a pedestrian space story occasionally: the first Brood story with Cockrum, shortly before the one with Cockrum, comes to mind. Lobdell's pedestrian scripts and his tendency to set up plots that were never resolved. I'm something of a Lobdell apologist, as I thoroughly enjoy his post-crossover "quiet" issues and think he might have done better for himself if he hadn't been writing at the height of the X-Men's "they're so popular editorial needs to meddle constantly" era, but some of his quirks (notably his tendency to just throw unformed plot ideas out there and see what sticks) drive me nuts. I'm fairly sure that this is where/when I tried to buy X-Men regularly, although it wasn't always possible. Cockrum's pencils look really good with Dan Davis inking. I've read this so many times since it came out, but the sheer creativity is still palpable. Yeah, I know, it's full of LSH and Star Trek homages, but that's part of the fun, and it's not as if the work is phoned in; there's plenty of action, plot, characterization, and Easter eggs like catching all the Legionnaire doppelgangers, with Cockum turning in yet more cool costume designs. I don't know if you've read ElfQuest, but Claremont and Byrne will be referencing it slyly in some dialogue down the road, and here I'm always struck by the fact that it's as if Lilandra and Xavier "recognized" each other. Like Jean says on Pg. 17 (of the story, Pg. 30 of the issue): "I've heard of coincidence, but this is ridiculous." Was there ever a reference in some later story that I either forgot or more likely never read to Cyclops and his dad crossing paths in a highly inhabited Marvel cosmos? I'd never made those connections to Star Wars that you did with the princess and the space pirates, etc. Nice! 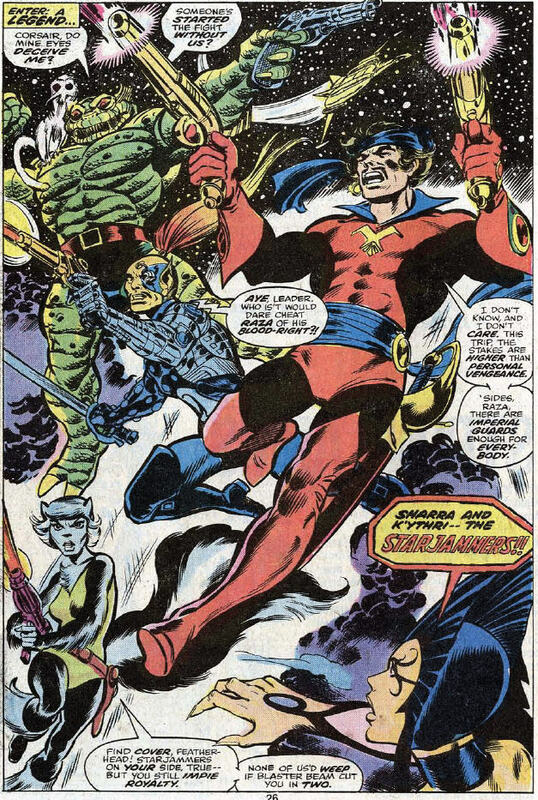 As for the observation that in today's market Cockrum would keep the Starjammers concept to himself and publish it somewhere else, he sort-of did eventually do that with his creator-owned superteam The Futurians. There's no question, though, that Marvel benefitted from the likes of Cockrum and Byrne introducing concepts such as the Starjammers and Alpha Flight as work-for-hire when it was basically the only game in town. @Blam: Cockrum's pencils look really good with Dan Davis inking. They really do. This is easily my favorite art from all of Cockrum's issues in this run. It is indeed tons of fun. And, as you pointed out (I believe) in an earlier post, at the time, the Star Trek references weren't quite as obvious as they are today. I have not (it's on the ever-lengthening "to be read" list) but I know Claremont references it occasionally, especially in "Kitty's Fairy Tale". Was there ever a reference in some later story that I either forgot or more likely never read to Cyclops and his dad crossing paths in a highly inhabited Marvel cosmos? You know, I can't think of one off the top of me head, but I feel like there has to be, which probably means there is, I read it once, and promptly forgot the details. Maybe around the time of the whole Vulcan/Third Summers brother retcon in Deadly Genesis? I'll have to go back and look. There's no question, though, that Marvel benefitted from the likes of Cockrum and Byrne introducing concepts such as the Starjammers and Alpha Flight as work-for-hire when it was basically the only game in town. And for all the gripes (legitimate and imagined) you hear all over the place about "comics these days" I really think that has a lot to do with it. You're just not going to see the kinds of great, original, new characters that you did in the 60s/70s/80s popping in a Marvel or DC book as often anymore because there's so many more avenues for creators to feature their creations and still retain full control. (Not that I begrudge them that freedom, of course, it's just kinda sad that great new contributions to the ongoing Marvel and DC tapestries are fewer and father between these days...). When you do, I highly recommend, if possible, reading the original run (from the first WaRP ElfQuest #1-20 — which is all you really "need" to read) in the four Donning/Starblaze collections. How easy or cheap they are to come by these days, I don't know, and I'm sympathetic to the fact that the Pinis (and Collen Doran, and apparently others) sued the company in some dispute later on, but I've never seen other reprints of the story reproduce the lush color of those volumes. @Blam: I highly recommend, if possible, reading the original run (from the first WaRP ElfQuest #1-20 — which is all you really "need" to read) in the four Donning/Starblaze collections. Good to know, thanks! I'll have to look into those. I always saw this more as an explanation for why we haven't really seen them much since #65 compared to other alien races. On that note, if there's one thing I hate about the Silver Age (quick digression here - the majority of comic books I read when I started getting into comics were Silver Age stuff, back in 06 - 07), it's the way in which random alien races will be created for a single story arc, and then never used again. I get that the universe is really really big, but it just feels so cheap and pointless. I always liked this, as it made it feel like the previous X-Men arc prior to GSXM actually mattered. The first time I read X-Men #94, I had no idea that the previous issues had been reprints, so I was slightly confused that there was no reference to any recent issues. @Harry: I always saw this more as an explanation for why we haven't really seen them much since #65 compared to other alien races. That definitely fits as well. Yeah, that's always bugged me too. It's definitely a function of the times: LOTS of stuff gets introduced randomly and forgotten in Silver Age comics, since no expected anyone to ever re-read them or remember the details for more than a year or two (before the readers "grew out of" comics), but it can still be annoying. Though I do enjoy it when later writers come along and bring some order to the randomness. In Black Goliath #5, Sharra is referenced in the context of Sharra's Forge, the cruellest terrain on the cruellest of planets, Kirgar. The forge was named, "in bitter irony," for the mother goddess of legend. In this story, the alien Derath references Kirgar as "once the throneworld of a mighty empire which collapsed a million cycles ago… leaving all of its glorious cities to crumble into dust." Derath had heard of the planet Kirgar and its legends, but, like most others, believed it to be a legend. But on one mission he discovered it as the desolate (desert and mountains) second planet from the blue-white star Dharhalla. When the last warlord of Kirgar died, he left a guardian to protect his stronghold, a 15 foot tall axe-wielding robot called Mortag that activated upon people entering the stronghold. Black Goliath, along with Celia and Keith Jackson were banished to Kirgar by a beam weapon powered by neutron star matter. It was never clear whether this was the planet, The World, on which stood the M'Kraan Crystal, but the terrain was comparable to that in Uncanny X-Men #107-108. If Kirgar was another planet, perhaps the creators of the M'Kraan attempted it on other planets, playing around with neutron stars first and then ramping up after there!? Dune cats (tiger-like creatures) survived on the planet, so perhaps Kirgar was meant to evoke a feline race (just as the Shi'ar were avian)? 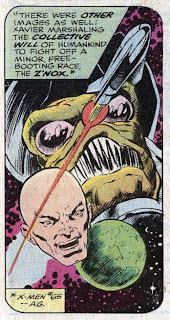 Of further interest is the beam weapon that sent Black Goliath to Kirgar, called the Z-Ray. Did the Z stand for "zero energy" that Jack of Hearts was able to generate? The Z-Ray was first used by Stilt-Man. What the frell was Stilt-Man in search of an alien energy source for? The weapon is later destroyed by Darkstar, a wielder of the Darkforce! Hey maybe Wilbur Day's suit could be from an empty M'Kraan guardian even;)?